Are you interested in learning how to play the harp or piano? With an advanced degree in music and years of experience, Dr. Grace Bauson is the teacher for you! Grace is on faculty at the University of Mary Washington and maintains a private studio. Fill out a contact form or click the link below to learn more. Grace Bauson has studied with some of the most renowned harpists of the century, including Lucile Lawrence at Tanglewood, Judy Loman at the University of Toronto, and Elizabeth Richter at Ball State University. A recipient of a Doctor of Arts degree in Music Performance, she has taught private and group harp and piano lessons, as well as college level music history and music theory classes. She has performed throughout the United States and Canada as a soloist, chamber musician and orchestral player. Read Dr. Bauson's biography. Grace is interested in helping students achieve their goals, whether it is to learn a new instrument as a hobby or to become a professional musician. She will work with you in weekly one-on-one sessions, individualizing lessons to reflect your musical interests and learning style. A proponent of musical improvement through intensive summer experiences, Dr. Bauson enjoys working with students at summer music festivals and institutes. She has served on the faculty of the Rocky Mountain Springs Harp Program in Steamboat Springs, Colorado, and encourages her students to take advantage of inspirational learning opportunities. 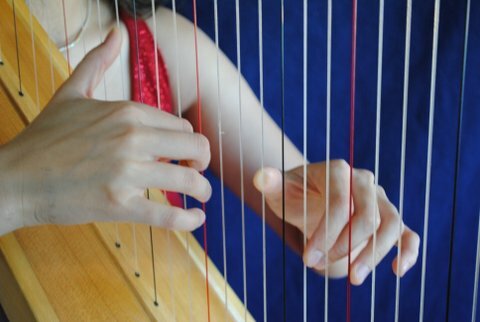 Many of Grace's students have become members of the internationally known American Youth Harp Ensemble and have performed in Austria, Carnegie Hall, the Kennedy Center, the White House, on CBS-Channel 6, and many other venues. One of her students was named one of Richmond's Top 13 Under 13. Until the fall of 2013 Grace taught at the Academy of Music in Richmond, Virginia, where her students regularly performed in recitals, master classes and throughout the community. A past adjunct harp instructor at James Madison University and Southern Virginia University, Grace has decided to concentrate on her students at the University of Mary Washington and her private studio, where her passion is to enable students to achieve their musical potential. For more information about lessons, please fill out a contact form.